The antibody detects a 130 kDa protein corresponding to the molecular mass of phosphorylated p130 Cas on SDS-PAGE immunoblots of pervanadate treated human endothelial and A431 cells, but is not observed in control cells. Phospho-p130 Cas (Tyr-751) synthetic peptide (coupled to KLH) corresponding to amino acid residues around tyrosine 751 in rat p130 Cas. . 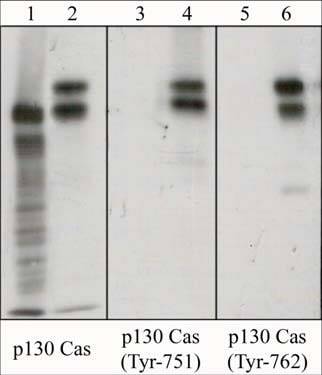 This antibody was cross-adsorbed to phospho-tyrosine coupled to agarose and to phospho-p130 Cas (Tyr-762) peptide before affinity purification using phospho-p130 Cas (Tyr-751) peptide (without carrier). Our Abpromise guarantee covers the use of ab45486 in the following tested applications. WB 1/2000. Predicted molecular weight: 93 kDa. ab45486 has not yet been referenced specifically in any publications. Publishing research using ab45486? Please let us know so that we can cite the reference in this datasheet. There are currently no Customer reviews or Questions for ab45486.